This area has been called Higashi Chaya-gai(Higashi(Eastern) Geisha District). Even today,the music of shamisen lutes and taiko drums wafts through the air from lamplit geisha houses in the evening,reminiscent of the days Kanazawa was a castle town. There are no cherry blossoms,but from the traditional town you can see Sakura at Mt.Utatsu. 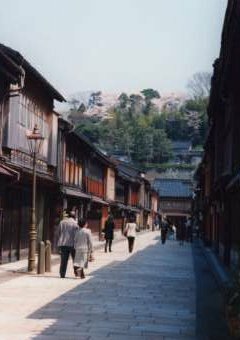 In Kanazawa there are three famous geisha district. The other two are Nishi Chaya-gai and Kazue machi.